The material presented here does not provide a method to help an aggressive rat become friendly. I just love Pemy so much that I want to share her in video and photos. What did I DO that helped Pemy and Dicey? I rewarded, with food, all good behaviors. I taught them to love a transport box to enable me to manage them and their cage. I used desensitization and counter-conditioning techniques, and positive reinforcement. What all of this means is a topic for another time. What did I NOT do with Pemy and Dicey? I never forced either of them to do anything. I never held them against their will. I never grabbed them for any reason. I never did anything that would have caused them to react fearfully, much less to fear me. 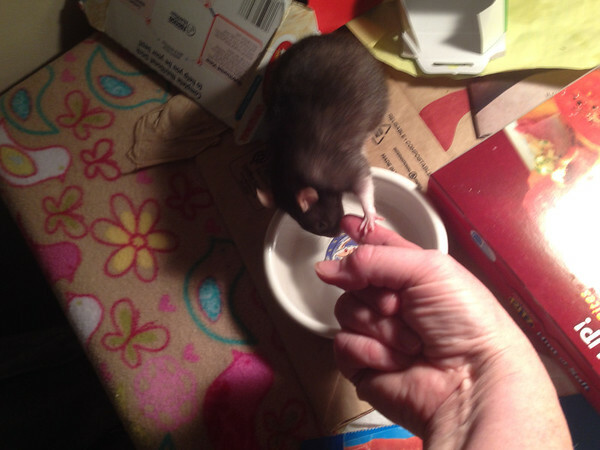 Watch Friendly Pemy Rat politely shove my fingers out of her way, so she can eat her rice with olive oil the way she wants. Woo hoo for Pemy! Click here to view the video below in lightbox mode. Pemy and Dicey. Early photos of them. Pen and Box Playspace. How I gave Very Aggressive Pemy and Dicey play time in a large space, where I could contain them and keep myself safe. Bitten By Pemy Rat. Graphic photos of blood! Be Warned. Helping an Unsocialized Rat Love a Transport Box. Oh BABY was this key for Pemy and Dicey. Using a Neck Box with Shy Rats. 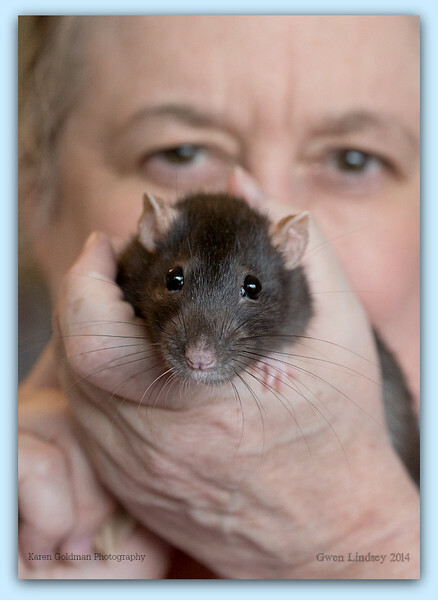 What would coax an unsocialized rat to enjoy hanging out with a human, and yet keep the human safe? For Pemy and Dicey, once they loved a transport box, we went on Neck Box rides. I had assessed they would not bite me during this fun time. Do not do this with your aggressive rat just because it worked for me. Dicey - Aggressive Rat No More. Pemy was the harder rat to win over. In the videos, Pemy is usually out of sight, ignoring me and thinking about chomping flesh. Letting Rats Use Their Teeth. Really! Pemy models good teeth activity. Pemy and Dicey were two sisters born shortly after their mother was rescued from a hoarding situation in Calfornia. At the rescue, as they grew, they took on aggressive behaviors, and eventually became extremely aggressive. As a consequence, they were considered unadoptable. The rescue was willing to let me have them, as I wanted to see if I could help them out of their aggression. They were about a year old when I adopted them. There were times I was not careful, and didn't wear gloves. The rats are sleeping way over there, and I just need to reach way over on the other side for the water bowl, so no problem, right? PROBLEM. Both rats would strike out and nail me like a snake Steve Irwin could not have avoided. I was bitten very seriously several times until I got my own behavior straightened out, and made sure I wore gloves. Both rats did bite the gloves, but never penetrated them. I ignored their bites and did minimal business in the cage, and left. 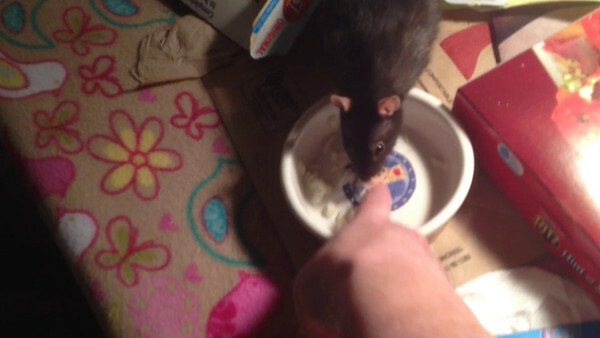 For their behavior of NOT snake-launching, I rewarded them with treats, usually yogurt or a yogurt-oats mixture, via a long-handled spoon. They viewed my offer with suspicion at first, but over time accepted the rewards eagerly.